Want to lose weight and reduce your risk of dying of a heart attack or stroke? Reduce fat in your diet, right? Wrong. We’ve been told this for decades. Yet, fat is not necessarily the villain we’ve been led to believe. Fat is required for the brain to function. Those deficient in good fats in the brain are prone to depression and mental hyperactivity, leading to sleep disorders. Fat is also required for absorption of fat soluble vitamins like A, D & E and making of vitamin A from beta carotene, as well as absorb and transport fat soluble vitamins to various parts of the body. It lowers LDL, the bad cholesterol and raises HDL, the good cholesterol that protects our heart. 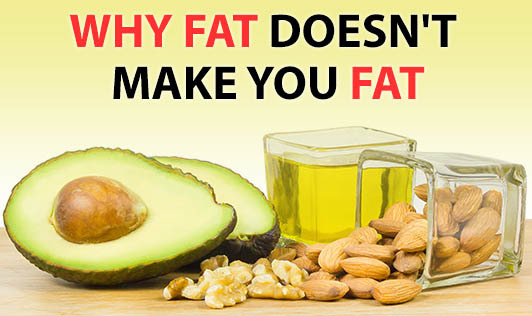 Sources of good fat are uncooked extra virgin olive oil, rapeseed oil, nut oils like groundnut and hazelnut oils, nuts, primrose oil, seeds and avocados. A meta-analysis published in the American Journal of Clinical Nutrition, examining 21 studies involving nearly 350,000 patients, stated: “There is no significant evidence for concluding that dietary saturated fat is associated with an increased risk of coronary heart disease or cardiovascular disease.”As for the link between fat intake and obesity, again the evidence doesn’t stack up. In America, for example, average fat intake has dropped from 43% to 34% of calories, yet there’s been no significant change in rates of obesity. So what’s causing the rise in obesity and related conditions such as diabetes and heart disease? Refined carbohydrate -- sugar, refined white flour and hold your breath, corn (yes!) is emerging as the culprit – and is posing a far more serious threat to our health than fat. So cut down on refined carbs. And see your oodles of fat disappear! Replace instead with the whole wheats and the bajras of the world, to get the high fibre that blasts fat out of your body. And don't forget to drizzle some extra virgin olive oil on your whole wheat toast before you bite into it.